A season, pre-season and next season-defining game all in one, the stakes couldn't be much higher for Connacht this weekend. Connacht remain in control of their own destiny but only after a surviving a major shock in Parma after a very poor display. The last time Connacht met Sale in the knockout stages of the Challenge Cup, it was a two-legged affair and the English side progressed to reach the 2005 final. On St Patrick's Day, 2017, Paul Boyle was part of an Irish U-20s effort that fell just short in stopping England win a Grand Slam at Donnybrook. Andy Friend will waste no time in throwing Jack Carty, Ultan Dillane and Kieran Marmion back into provincial action after playing their part in Ireland's Six Nations campaign. Andy Friend praised the impact of Kyle Godwin as his stand-in out-half tamed a blustery Sportsground with a perfect kicking and playmaking performance. 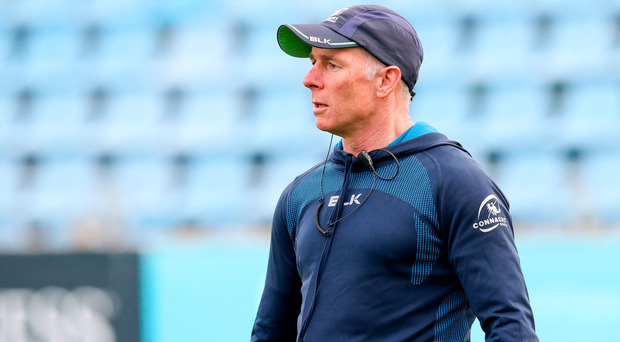 Jack Carty and Bundee Aki will not be available for Connacht against the Ospreys on Saturday as Joe Schmidt opts to keep them in cotton wool ahead of the French clash next weekend. It's safe to assume that the next time Jack Carty laces up his boots for Connacht he'll become the province's leading points scorer of all time, but it was his game management that caught Andy Friend's eye as they claimed a vital conference win over Cheetahs. Jarrad Butler's late try secured a precious win for Connacht against play-off rivals Cheetahs as the Jack Carty-inspired home side fought hard to secure the points. Connacht have announced that prop Denis Buckley has signed a new two-year contract extension to remain at the province until the summer of 2021. Whatever about the other three provinces, it's boom time for Connacht too. The feel-good atmosphere in Connacht shows no signs of stopping as the Westerners' back-room coaching staff all committed their futures to the province. Quinn Roux said that his prime focus after being left out of the Six Nations squad last week was to continue to play well for Connacht and be ready if an opportunity arose. Connacht will meet Sale Sharks for the third time this season in the quarter-finals of the Challenge Cup after staging a dramatic victory at Stade Chaban-Delmas. Connacht prop Conor Carey has emerged as a target for English Premiership side Worcester Warriors. Connacht have been handed a further boost after Ultan Dillane put pen to paper on a new two-year contract extension that will keep him in the west until at least the summer of 2021. Connacht lock Ultan Dillane has signed a new two-year contract to stay at the province until at least the summer of 2021. Connacht out-half Jack Carty has signed a new two-year contract to stay at the Sportsground until at least the summer of 2021. Quietly and methodically, Connacht have put themselves in a position of real opportunity over the past couple of months. Jack Carty is leading the pack chasing Johnny Sexton when it comes to place-kicking. The nature of Saturday's last-gasp loss to Leinster would have lingered well into yesterday's Christmas dinner for the Connacht players, but out-half Jack Carty wants to see a response against Ulster on Friday.